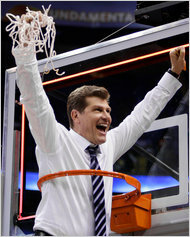 Coach Geno Auriemma has led the UConn women’s basketball team to seven NCAA Division I basketball championships, and has won six national Naismith College Coach of the Year awards. But what he has put in place yesterday may be his greatest leadership achievement yet. He has established the Sandy Hook Scholarship Fund at UCONN. It will help support the college costs for any siblings of those killed in the assault, the dependents of the adults who also lost their lives, as well as students currently enrolled at the elementary school. What this provides in all of the darkness is a bright future to a great University I was fortunate to attend on a scholarship myself. Something that will provide sustaining hope for so many. So it’s time to pay it forward. Please join me by donating at www.friends.uconn.edu/sandyhook. I just participated in the National Moment of Silence. Now it’s time to get loud with your donation. Might be the best holiday present you can give.